Karen R. Tolchin is the author, with Kyle Mercer, of the new book Stop Parenting: One Helicopter Mom’s Life-Changing Transformation. 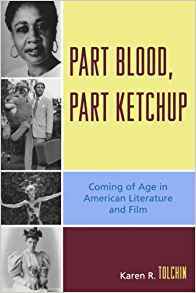 She also has written the book Part Blood, Part Ketchup: Coming of Age in American Literature and Film, and her work has appeared in a variety of publications, including The Rumpus and Gulfshore Life Magazine. She is an associate professor of English at Florida Gulf Coast University. A: Stop Parenting: One Helicopter Mom’s Life-Changing Transformation grew organically out of a series of mind-blowing conversations I was having with my life coach, Kyle Mercer. I was struggling mightily as a mom, and his take on every situation was radical and different from anything I had seen, heard, or read before. Yet the wisdom and truth of his words were undeniable, and when I started to implement his recommendations, life got much better for my son Charlie and for me. But the truth is, Kyle’s approach to parenting seized my imagination. I began to wonder how much suffering a book like this could relieve. Writing the book with Kyle has helped to seal the knowledge in me, so I’m very glad I took this journey with him. Q: How would you define the idea of “Stop Parenting”? That’s why this book can help everyone, regardless of parent status. It’s about recognizing the central triggers in human relationships for what they really are, i.e. opportunities for individual growth. This philosophy serves as a catalyst to get us to question how and why we are acting from various egoic positions, rather than from an organic, mutually respectful place of being human. Kyle debunks a number of harmful myths about the role of parents in our culture. The book stands as a road map for a much healthier relationship between parent and child, and human to human. Q: Much of the book is in the form of dialogues between you and your coach, Kyle Mercer. Why did you decide to structure the book that way? A: The dialogues are an unusual formatting choice, that’s absolutely true. 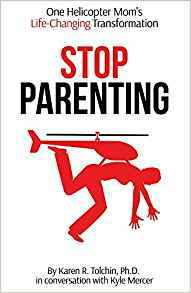 Stop Parenting is one part memoir, one part parenting manual, and one part Socratic dialogue. My literary agent recommended against the dialogues, because it might prevent publishers from recognizing how and why to market it. We decided to keep the dialogues and go a non-traditional publishing route with the intention of getting this into the hands of other parents who need this wisdom. Our hope is that it helps so many people, it starts a bona fide movement. Q: One of the themes you discuss is the idea of the “bad mother.” How does the “Stop Parenting” idea seek to change women’s ideas about themselves and their kids? A: At one point in the book, Kyle reveals to me that the toughest judgment women place on themselves is the “bad mother” judgment. It’s the hardest thing for women to work through in their private coaching sessions with him, much harder than any “bad father” stuff men might need to work through. I was not surprised to hear it. Moms (usually) carry their children in their bodies, and we form a special attachment. On top of that, our culture bombards us with messages about what mothers are supposed to be like. If we deviate from the ideal, we fail our children. That’s a huge amount of stress placed on women, and we internalize it and exert it on ourselves. Stop Parenting shows how and why to let all of that go. It’s quite freeing, as the film Bad Moms showed quite colorfully. That film resonated as much as it did because of the enormous pressure moms feel on a daily basis. Q: Who do you see as the audience for the book, and what do you hope readers take away? A: Certainly moms are a natural audience for this book, as well as dads. The dad side of helicopter parenting seems most apparent to me on the sidelines of soccer fields and in sports contexts. Anyone who believes he or she might be more effective in his or her role as a parent, or who wants a fresh way to think about the whole project of parenting, should read this book. For that matter, even non-parents can benefit from the basic lessons of what Kyle Mercer calls the Inquiry Method, the cornerstone of his practice. Those lessons emerge in Stop Parenting. widely as possible via conversations like this one. My hope is that it might lead to Stop Parenting retreats, where participants can examine their own beliefs about the parent-child relationship and learn new strategies. We talk a lot about trading entanglement for engagement; these retreats would show everyone what that would look like. Elsewhere, I teach and write creative nonfiction, so I’m always percolating with new memoir projects. A: It’s been a genuine pleasure talking with you! Thank you so much for the opportunity.